Some years ago, when I was a young seminarian, I served with an Episcopal priest who greatly disappointed me in conversation one day by telling me that he saw “no need” for angels. “There’s nothing that angels are described as doing that the Holy Spirit could not do instead.” This kind of heavenly economy had never been offered to me as a theological reason before. When I thought about it, I realized that there was nothing that we could do that the Holy Spirit couldn’t do better, and wondered whether we existed. It seemed silly to me to posit something as not existing simply because you saw no need for it. Later that week I was in a prayer group with this same priest (in his parish where I worked). It was a fairly informal group, and I have to confess to pure naughtiness when I said to the group, “Father said he sees no need for angels.” I don’t know what I expected, but the response was a sudden torrent of people sharing stories about angels that were purely wonderful. It included a story by an elderly woman who told of seeing an angel by the bed of her dying child. By the end of the evening, my priest friend had recanted and professed a belief in angels. That is a story from the confusing time of an Anglican seminarian. What do you do when your professor and mentor just ups and denies a cardinal doctrine of the faith? I didn’t know at the time, so I probably did something wrong – though the outcome was good. In the years since then I have had occasion in sermon or in a class to share a story about an encounter with an angel, or the intervention and help of an angel (I have a few such stories to tell). Without fail the result has been the same as that first night in a prayer group in Chicago. The story I tell is met with a torrent of similar stories. It seems that many people have angelic encounters but (at least in the circles I was in) were afraid to tell anybody. Apparently if you live in a two-storey universe and you tell about an encounter with a second-floor creature, some people are afraid of the consequences. Thus we have the strange phenomenon of living in a one-storey universe where God is everywhere present, where the holy angels surround us moment by moment, and at the same time we have a great conspiracy of silence not to tell anyone about how things really are. Secularism is just one large myth. Tonight my wife and I prayed the Akathist to the Archangel Michael (we were offering intercession for a friend). At the end of the prayers my wife said quietly to me, “St. Michael has always been a good friend to us.” It was a time for me to pause and remember how many times through 33 years of marriage we have stood together and asked St. Michael to come to our aid. Sometimes it has been through our own need, other times for the needs of others. But what we have known has been the faithfulness of the “Chief Captain of the Heavenly Hosts” to do battle for us and protect us in all of our spiritual battles. I do not have an answer for someone who would deny the Holy Angels and subscribe to some form of theological minimalism. With a God who doesn’t make two snowflakes alike, what place does minimalism play in the universe? I’m Orthodox – which is always maximalist. Our God is a great God. Rejoice, O Michael, great supreme commander, with all the hosts of Heaven! 7But when ye pray, use not vain repetitions, as the heathen do: for they think that they shall be heard for their much speaking. 8Be not ye therefore like unto them: for your Father knoweth what things ye have need of, before ye ask him. Why are you then praying to an angel and asking for intercession? Our mediator is the Spirit of God and Jesus Christ, that is for the Church of God. Praying to them has nothing to do with why they should guard us. Those who follows God’s commandments has an angel who is responsible to guard them. If you don’t mind I’ll add an angel story of my own, one of many in my family. Years ago I was living in Fargo, ND. I was driving home late one night. So late it seemed as if no one else was on the road. I was going the limit on the street I was on (about 35) approaching a green light prepared to sail on through. Suddenly this voice yelled at me “Slow down!!!!!! !” I was so startled that I lifted my foot from the accelrator, but never got it to the brake. It was enough as another car going quite fast ran the red light in front of me. I had decelerated enought to keep out of the intersection. At least two lives were saved that night. My wife and I developed the expression “My guardian angel was working overtime” as a quick thank you and expression of gratitude for all of their tireless intercessions on our behalf. This time of year, as we move toward the celebration of the Nativity of our Lord, is stuffed with the presence of angels. (A side note on minimalism, I recently heard a Catholic woman ask her priest, Father, what does the Holy Spirit do, isn’t Jesus enough?). what does the Holy Spirit do, isn’t Jesus enough? I am sure that if He chose to, the Father could save us with one hand tied behind His back. As it is, He seems to have chosen to use both hands. How can we know if angels hear our prayers? How can we know if we should be praying to angels? Thank you for encouraging belief in angels! Thank you also for the reference to the Akathist to St. Michael. I hope to take my children to celebrate Divine Liturgy on the ocassion of the Synaxis of the Archangel Michael and the Other Bodiless Powers. God is so very good to us! Sadly, a number of people whose Biblical training did not include the communion of saints, are alarmed by prayers to saints or angels, having confused prayer with worship when they are not at all the same thing. Unlike those who have jettisoned the Tradition of the faith, and substituted modern Bible interpretations, the Orthodox faith has always taught the intercession of the saints (the Scriptures are quite clear that they are going to do this whether we ask them or not) or of the angels. Asking a saint to pray for me, or asking an angel to act on my behalf is no different than someone asking me to pray for them – in fact it is exactly the same – with the exception that one of the saints or an angel will pray better and more strongly than I will. The practice of asking for the prayers of the saints is a proven fact of the life of the early church, even if not found explicitly in the Scriptures. The verse quoted above forbids worship, which of course the Church has never taught. But someone needs to teach some people that worship and prayer are two different things. Why is that hard to understand? I know that angels hear us because the Scripture is repleat with such stories. How do I know if we should be saying such prayers? Because the Church and the saints of the ages and the teachings of the Holy Fathers tell us it is good and useful. When in need I pray to God, Father, Son and Holy Spirit. I also ask the prayers of saints to join with me in my prayers and the angels. as well. I need all the help I can get. My prayer relationship to God is not just a “me” thing. As you will notice, the Lord’s Prayer says, “Our Father,” not “My Father.” Doesn’t the Our include the saints in heaven? They are praying with us. I give some time in the near future to do a posting on the prayers of the saints (and angels). But for this morning that’s all I can say. For protestants who are troubled by this, I understand. You have not been properly taught. But this is the faith of the Fathers of the Church and the faith that has always been held by Christ’s Holy Orthodox Church. The question is rather, “Why after 1500 years of uninterrupted practice, did the Reformation try to destroy such a practice?” How could Reformers who despised Holy Tradition read the Scriptures and interpret them better than those who had read and taught the Scriptures faithfullly for 1500 years? The Eastern Church did not have indulgences and merits and the thintgs most attacked in Rome. But we did honor the saints and their relics as is fitting and properly defined by the 7th ecumenical council. I am a member of the Church, which is One. I am One with the saints in heaven (for they are also members of the One Church). How dare someone forbid me to ask the prayers of my brothers and sisters, members of the One Body of Christ? Do you think they are dead and no longer capable of prayer? That contradicts the clear teaching of Scripture. They stand about as a great cloud of witnesses (and it is us they are cheering on by their prayers). Those who forbid asking the prayers of the departed or praying for the departed are among those who have created a two-storey universe and seek to divide the Church between the living and the dead. This cannot be since Christ, who is our life, reigns with them and refuses them no good thing. The Church is One and all the bad Bible interpretations cannot make it into two! The Church is One. Thank you for the article, and for your lengthy response here which helps answer some questions. For me, I can understand the teaching about one-storey, and cloud-of-witnesses, and it makes a certain amount of sense. Theologically. But when I read stories of angels, or miraculous saints, or wonder-working relics, I struggle with what is simply unbelief. The little boy has cried wolf too many times… and what I mean is that I have seen too many charlatans, too many fakers, illusionists, and drug-induced hallucinations. How can the tales of – for example – Helen of Sinope, who’s severed head reportedly cures headaches – possibly be true in any meaningful sense? When there are entire wards in psychiatric hospitals with people who see aliens, hear voices, or believe they are Abraham Lincoln – what am I to believe about other people who see saints and angels? Precisely, the 24 elders offer up the prayers of the saints; as you said, the prayers of those in the Church–so does the holy Angel. They all offer up prayers to The Lamb. The holy ones and bodiless powers do offer supplication on behalf of us–St. John had gone to the trouble of actually explaining what the bowls and censer represented rather than leave it to the imagination–they offer intercession before the throne of The Lamb which is Christ our God. Thanks for explaining in more detail father Stephen. It is helpful. Yet one should not go looking for angelic encounters / miracles etc. As Lewis said, these tend to occur at the great ganglions of history, at times of great danger, misery and martyrdom. Wurmbrand desribed his own experiences with the angelic reality – at the depths of his imprisonment in communist Romania. And having experienced that, one should hold onto that not as a moment/event to be reverenced in and of itself, but as a moment/event that points to Christ. It is always possible that the means of God’s saving grace, be they physical or phenomenological, become more important than their originator. They are windows, or markers – treated otherwise, their fate might become like that of the Bronze Snake Moses made in the desert, which had to be destroyed. Others of us have found and can recommend as well Archbishop Puhalo’s book “On the Angels”. Short and to the point ( http://www.synaxispress.com/bookstore5.html ). Going back to find these is always a good reminder: “visible and invisible” …. from the Creeds we pray everyday… it is so easy for the words to elide off our lips and cease to remind us of what they mean that every now and again, it’s good to have an article like this… to jar us out of the routine and back to reality that there is a reason as well to the order of our prayers… even if we often hasten to get to the parts that focus on our more immediate needs. Thanks for this reflection! The Holy Archangel Michael is my patron saint, I really appreciated this post. And, I also have a couple of angel stories, it indeed is very humbling. There is no image of God anywhere in Scripture in which He is not surrounded by crowds. He is the Lord God of Hosts (Sabbaoth). I do not understand why some want to insist on an individualized God for an individualized Christian – neither is taught in the Bible. These are modernist innovations and depart from Scripture and the Tradition. God is Trinity – and man exists only as a communion. If you are not in communion with the saints, then you most certainly are not in communion with Christ. “As the body has many members, so also is Christ,” the Apostle teaches us. Yes, I am always afraid to tell anyone my angel story for fear they will think I’m nuts. I share it only after I have grown to know people well and no longer fear rejection by them. And yet, when I remember it, I am warmed by the comfort I received that night, by the knowledge that God loves me and forgives me. When I forget and “demand” proof, when I want to know why I don’t receive blessings I ask for, I am reminded of the angel who visited me and the words he said – and I am humbled and confess that I have not learned, like Paul, to be content in my circumstances. I realize that God blessed me beyond measure with that one encounter which I had no right to expect that one, much less want something more. Perhaps some angel experiences are never meant to be broadcast about, but were always intended to be imtimate, quiet encounters. People have “one-storey” experiences, but are frightened to speak, I think, because the “two-storey” worldview dominates and makes it all sound weird. Remaining quiet because humility and privacy are a good thing is another matter in itself. But isn’t the presence of counterfeit in and of itself evidence of the existence of the real thing? Would there be counterfeit currency if there were not genuine currency, for example? It seems to me that satan’s very effort to mimic the truth works against him. Thanks for the response, Rhonda. You’ll get no argument from me on the point you make. I was only trying to point out some of the reasons why I – and perhaps others – will be reluctant to accept such reports at face value. Happy feast day to all who call on St. Michael or any other angel as their patron. Ronda, good point! Unfortunately, unless we guard and promote the reality, the coin of spiritual things is greatly devalued by the existence of so many fakes. In economics the saying is “Bad drives out good”. Unless the quality of the money supply is maintained with active measures by government, everybody suffers economically. Perhaps we need to speak more directly about who angels are (not the personal experiences so much) but the reality and the presence of them, describing them correctly. Fr. Stephen, thank you for your effort in that regard. Father, I haven’t read all the comments on this wonderful post just yet, but I wanted to say thank you for this simple statement you made: “For protestants who are troubled by this, I understand. You have not been properly taught.” it takes a lot of courage and resolve to make such a statement in these ecumenically-minded days. but it really is the only thing an Orthodox can say. we can argue Scripture, we can talk semantics or historical context. but in the end, protestants have not benefitted from the splendor of the teachings of the true Church of Christ, and that is the issue. “they have not been properly taught.” thank you, Father Stephen. I recently lost a very important ring that was given to me as a present from my aunt. I do not want her to find out that I’ve lost it, and I’m still looking for it but I may need to replace it. So I went to the jewelry store where my aunt bought it, and told the saleswoman the story, and she told me about her friend who lost her wallet at a bar, so she prayed to St. Michael who she said is known to help people find things. And a week later, she went back to that bar and it was sitting on the mantel of the fireplace with nothing missing in it. So I was just wondering if its true that Saint Michael is known to help people find things? I’ve not heard St. Michael associated with finding things so much as St. Vonorius, and St. Antony of Padua. For many years, I subscribed to a similar view, believing that the Holy Spirit was all one needed. Yes, the Holy Spirit is all one needs, but alas, one is easily led astray into the dark corners, where powerful and unseen forces are at work, whose sole agenda it is to destroy the Church, and all who profess faith in the Lord Jesus Christ. In some cases, so powerful is the grip on the soul, that the powers cannot be overcome without God’s direct help. It is here that angels and archangels come into play. This year has been quite a year. A few hours before Holy Pascha, I visibly experienced what the Orthodox Church calls Holy Fire. I had not heard of such a thing at the time, nor indeed was I aware that the evening in question was the evening before Holy Pascha. In fact, I was familiar with neither the Eastern Orthodox liturgical calendar nor the Paschal cycle. Frankly, I would never have remembered the date in question had it not been for another extraordinary event. But I can see now, that my experience of the Holy Spirit up to that point, was in some vital way, limited. I digress. Let me just say this. Within a month of Pascha, I encountered the angel of the Lord’s Presence, but this is another story. As somebody once said. It is by grace that we became sons and daughters of God. Christ is the Son of God in His very nature. I scrolled to the side bar and this post caught my eyes and my fingers to guide me to it. I was praying to him this week. I had so many of those askings to the Archangel myself. My kids grew up in St. Michael and just my countless needs for them, always there watching them for us through their lives. Hope one day they will be a witness too calling him and remembering thei life there. St. Michael the Archangel is very quick to acquiesce to our prayers. Concússum est mare, et contrémuit terra, ubi Archángelus Michael descéndit de coelo. Allelúia. On another note, may I point readers to Fr. 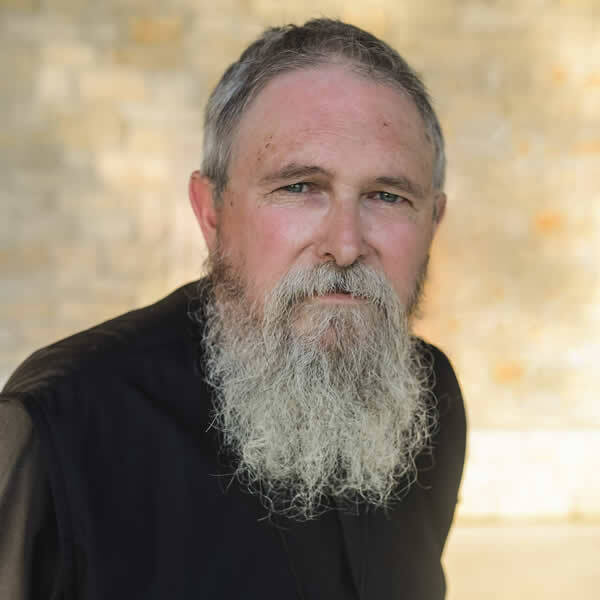 Tom Hopko’s “The Acquisition of the Holy Spirit” by St. Seraphim of Sarov, now being streamed on Ancient Faith radio. Thank God for the Archangel Michael, and for your intercession Father Stephen! Thank you. . my first of many encounters with this nourishing site. About 15 years ago, my daughter Sally who has a progressive nerve disease and I were traveling and sitting in an Atlanta airport gate area waiting for our plane that was delayed because of weather. She was sitting in a wheelchair, cold, tired and grumpy. I was doing my best to jolly her along and keep things pleasant. Along came an old man, presumably an airport employee. I knew right away he was a Christian by the love and joy all over his face. He covered Sally with a soft navy blue Delta airlines blanket, gave us encouragement and reassurance about our flight and connections. Before he left, he wrote down a few Scriptures and his address on a small piece of paper. After we returned home, I looked up the Scriptures and wrote a short note to thank him, but never got a reply. A while later, I looked at the address again and noticed his name and street address: Mickey Eden… who lived on Medena Way. Medena Way… if put together would spell M. Eden Away…then I wondered…was Mickey Eden, Michael of Eden, the angel? Over the years the blanket he gave us has proved to be strangely comforting, such as when grieving the loss of my marriage, when going through the painful process of healing from childhood trauma. It has been used as a prayer shawl, a head covering, a compress for a broken heart, a safe hiding place. The blanket smells something like a mix of fresh clean air and a small kitten. It seems imbued or anointed with love – the tender safe parental love and warmth I never knew as a child. It has been washed numerous times, stored away for years at a time, but has never lost its distinctive fragrance or softness. Was this a human or angel? Could be either. God sends His anointed messengers angel and human because He is very concerned about and wants to comfort broken hurting people. I have other stories of God’s healing love… Thanks and glory be to God for all things. Georgia, beautiful story! Thanks for sharing. Glory to God for all things, indeed. I have a friend, Louise, who may have some things in common with your daughter. She has recently lost the ability to move her ankles because of advancing peripheral neuropathy and can no longer walk. This is just the latest in a long list of physical setbacks and disabilities she has experienced beginning even in childhood. I would appreciate the prayers for Louise of any who read this who are moved by the Holy Spirit to do so. (I posted a comment with a few more details about this also in Fr. Stephen’s recent post, Making Choices). What a wonderful story Georgia. It has St. Michael the Archangel written all over it. As Chief of the angelic hosts or bodiless powers, Michael is not limited in space time or by things material and spiritual, is never derailed from the ways of righteousness but remains an ever present help to those that seek the kingdom (cf. Isaiah 28:6). What seems to be a matter of impossibility, is to Michael a mere thought act — such is his strength. St. Paul enjoins us to entertain strangers, for in so doing we entertain angels (cf. Hebrews 13:2 and Revelation 1:20). The next morning, my husband, in a very disgusted voice said, “You will never believe where I found her last night… sitting right in the middle of a bunch of homeless people!” I just smiled and said… “But she was there when you got there and they kept her safe.” SMILE! The journey has been long but my daughter is now drug free. No one will ever be able to tell me that the “big fat homeless man” wandering the streets of Philadelphia is not St. Michael the Archangel!! AMEN! Bless Father. 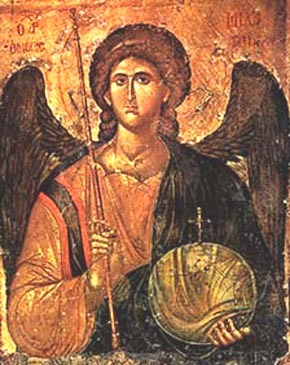 Is there any sheet music for an Akathist to St. Michael the Archangel that is on a web site? I was reading the discussion thread, and I was reminded of last winter. I haven’t seen anything like this before or since. I was outdoors, and two radiant golden crosses appeared in the sky. They looked to be about forty feet vertical and thirty feet horizontal distant. The crosses were the tone of actual gold, the metal, not bright yellow, and their luminance was soft, not bright. They were about ten feet apart, and each was about three foot high by two foot wide. They had gold rays radiating from them, like in certain artist renditions of the cross. I didn’t know what to make of them. I just look at them. I first thought they were extraterrestrial aliens. I even later told my mom, “I just saw two aliens.” I could see each with only one of my eyes. When I closed one eye, one of the angels disappeared. After I opened that eye and closed the other eye, the other one disappeared. But before I went inside, they flew West, and headed North. I tried to follow and see where they were going, but I was in socks and there was snow. The following morning God told me they were angels, so I told my mom they weren’t really aliens. She was relieved, because I’m at the top of the senior class, I’m very down to earth, I don’t seek attention. In fact, she’s the only one I ever told. I just didn’t feel a need to tell anyone else, because I didn’t really know anything. But I am a reliable witness. If I said I saw aliens, odds are they would probably really be aliens. I practice Roman Catholicism two hours a day. I read my Bible for one-half hour, uninterrupted, because I get a plenary indulgence, and I learn a lot. I recite Chaplet of Divine Mercy and the day’s five-decade Rosary. I tell God I love Him, and I pray for everyone I know. I wish I could attend daily Catholic Mass, but I have school. I miss the angels. I don’t know whether or not they will return, or if they do, make themselves visible to me. I do recite Chaplet of Saint Michael with Mother Angelica on EWTN. I don’t seek, but rather am suspicious of ‘visions’ without purpose, and ‘hidden knowledge’ not of rational origin. The cross beings did not identify themselves as God’s angels, nor spirits of darkness. They didn’t communicate anything I could detect. They hovered in the sky for several minutes, and flew away. If anyone has any ideas, I have a blog on wordpress, named after my name. Bless the Lord O my soul, blessed art Thou O Lord, bless the Lord O my soul and all that is within me bless his holy Name. Thank everyone for their comments. During the celebration of the Divine Liturgy, through the Icon of the Pantocrator, by Gods grace and mercy, He showed me the presence of the Saints and Angels and all the Heavenly Host! Be believing in the Lord Jesus Christ! Seek the Truth and the Truth will set you free! I am also a Greek Orthodox Christian and once was told by my bishop that without questioning your faith you can not search for an answer and grow spiritually. I am a Irish Roman Catholic and am so pleased to have found this site and all the beautiful references to angels and saints. I have always been drawn to St. Michael, especially as a child, not knowing the specifics of his patronage or anything. My childhood was very traumatic/voilent, and it was the saints I turned to – Michael for protection, and St. Jude for my lost cause. After my prayer to St. Jude I was removed from my home, and I grew up to be an American soldier and recently found that he is a patron saint of soldiers. I do not believe in coincidences that all things happen with God’s plan. Blessings to you all! Thank you, Colleen, That is such a loving and sweet testimony! First, sorry if I spelled your name wrong. Anyways, I don’t know about the Catholic branch (they have an extra set of books), but in the Baptist branch the Spirit is here to help guide us through the trials of life. I guess you could see it as the angel on your shoulder telling you what you should do while the devil is telling you to do something else. I have experienced angels and miracles. They are God-given. I am grateful. Praise God. Probably this is 10 years too late, but I saw your post just now, was moved at your description of your feelings towards angels, and the notion of miracles (or the authenticity of miracles). I was most moved by your reach-out for help. I had shared your feelings and skepticism for a time. I am a research doctor-to-be in the field of Neuroscience (currently at the University of New South Wales, in Australia), and so my natural inclination is to question the authenticity of accounts given by those claiming to have met angels, or to have had a supernatural/divine experience of some description. The wide-spread expectation is that someone like me, i.e. someone with a strong background in Science, would readily reject any notion of the supernatural. Many people, including you and me, have (or have had) significant difficulty wrapping their thoughts around the mere suggestion that angels exist, let alone more dramatic suggestions, e.g. a relic healing a serious disease like cancer, rising from the dead etc. You are certainly not alone in your thoughts, and importantly, you are not alone when you ask for help. Here I give a very personal testimony to the fact that the supernatural does indeed exist, and God and His angels are real. I wish to express that I don’t write these things lightly at all. My own personal experiences have lead me to believe that the metaphysical/supernatural is not a falsehood, as secular society has repeatedly suggested to us. There is simply no doubt in my mind about it. I have an adherence to the Roman Catholic denomination of Christianity, which is one of the Orthodox Christian denominations. My religious background has greatly enabled me to better understand many of the experiences that I have had, both as a child, and as an adult, that can only be described as supernatural, and even holy. Many of those experiences have been associated with devout prayer, while others seem to be more random. Specifically, at the age of about 15 years I had a most overwhelming experience with a holy angel. One evening at home I suddenly heard the most melodic and sweet-sounding music coming from my parents’ room. Such sweet and other-worldly music I have not yet heard in my life since. No one else in my family seemed to hear it, and even said they did not when I asked if they could. While my family dismissed my words, I went to investigate on my own. When I entered the room, the music was loud and clear and very generally came from where the bed was, but without any apparent source. The room glowed with a warm bright light, whose source was also indiscernible. I recall being afraid, yet at the same time, there was an overwhelming sense of calm, peace, and sheer clarity that filled my entire being. The pure holiness of the experience cannot be overstated. Aside from the fact that there was no radio, TV, or any such potential source of music, the sound of the music seemed to be all around me, as opposed to a focal point in the room. Nothing to this day, in Science, could possibly explain to me why on earth the room was glowing, and what indeed the source of that light was. During the event, a knowledge entered into my mind (not from within, but rather, from without) that the person making the music was sitting on the bed, and took on the male form. I had two choices: to a ask who it was, or to chicken-out and get out of the room. Unfortunately, and to my long-term regret, I chose the latter option. My fear got the better of me, and I never asked who that angel was. In spite of my faith, that single experience (which was the most explicit supernatural experience I have had to date), left no doubt in my mind of the existence of angels and the power God. I cannot deny, either as a scientist or an individual who adheres to a religion, that that event occurred in my life, was real, and was entirely supernatural and holy. 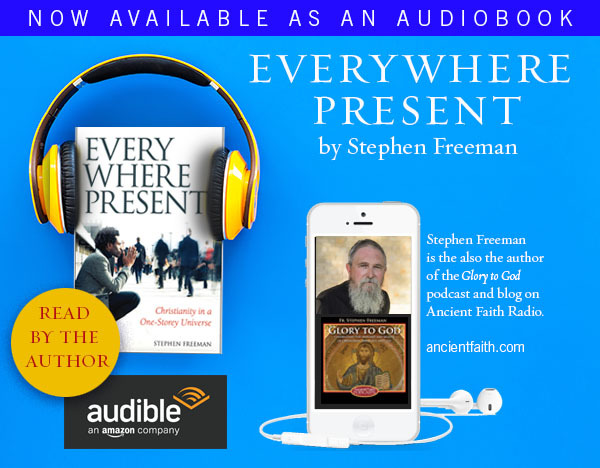 After my life-changing encounter with an angel, I was greatly moved to accept the stories of countless people around the world who claimed to have encountered angels (not to say, they are all true of course). After having my own personal experience with an angel of God, I say with conviction: the existence of God and angels is pure fact, just like facts as discovered by scientific method. Approximately 15 years later, after putting my angelic experience at the back of my mind, I decided to be bold very recently (late 2017), and flat-out ask The Sacred Heart of Jesus at my local parish one day who it was who came to me. Directly after asking the question I went home and started researching Archangels. The very first one who popped up on screen was St. Sandalphon; the Archangel of Music. Of course, that may have been a coincidence, but I really don’t believe it was. I later prayed to St. Sandalphon and a most curious thing occurred – I suddenly was able to play the piano, when previously I struggled to. For me, my supernatural experience with an angel confirmed that claims of encountering angels cannot be discounted, and ultimately, that no miracle is too extreme to be believed. That is: supernaturality cannot then have a limit, it either exists or not, and indeed it does. I hope this testimony; this true account, helps you and any others out there who are experiencing difficulties in accepting the notion of God and angels.